SPOILER WARNING: If you haven’t watched Season 1 of the OA yet, don’t read this. Homer and the rest of Hap’s prisoners are real. Remember the YouTube video the OA was so desperate to find at the beginning of the season? That’s the entire reason she wanted internet access. So, of course he’s real. So far, I’ve thought of two possible reasons for the books under the OA’s bed. The first is that they were, as many speculate, planted by Elias. This explains why he was in her home. Despite seeming obvious, it is a simple solution, and sometimes simple is better. The second possibility is that the OA ordered the books because they reminded her of her friends, and they brought her comfort. I’m not sold on this one. I do, however, find it intriguing that it’s the Iliad and not the more well-known Odyssey amongst those books. The shooter did not transport to another dimension. I was honestly surprised that this is a theory. The OA stated explicitly that you have to have the desire to go, or the movements won’t work. There was no indication that the shooter wanted to go anywhere. The OA’s death, or near-death, was necessary for her to travel. This is so inherently obvious to me that I struggle to explain it. The movements of the OA’s five disciples ended when the shooter was tackled and the gun fired a bullet through the OA’s heart. That’s an awfully strange coincidence, and this isn’t a story that takes coincidences lightly. Also, there was that whoosh as she was rushed away in the ambulance. Would Homer and the others have travel to another dimension with Hap? Again, the OA explicitly stated that without desire, you won’t travel. Why would Homer et al want to travel with Hap? But, if only Hap travels – does he have to die, like the OA did? What happens to everyone else back in his basement prison? If they do travel with Hap, how does he convince them to go? Where would Homer/Hap/the OA go? We haven’t really seen other dimensions yet, unless you count the “purgatory” space where the OA meets Khatun. With so many dimensions to go to, would they all go to the same place? I doubt it will be that easy for the OA to find Homer. Is Homer also looking for the OA? I assume he is. Perhaps Season Two will focus on his search for her as much as her search for him. Well, there you have it. 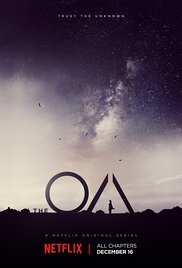 My theories on the OA’s ending, and my questions about what happens next. Let’s hope there is a second season so we can find out what the writers have in mind.